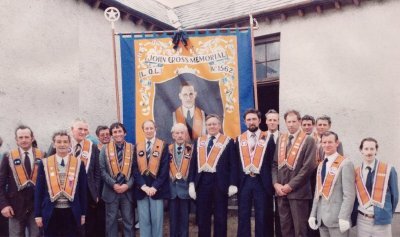 John Cross Memorial Loyal Orange Lodge was named after John Cross, a Quantity Surveyor and a member of Bennett?s Chosen Few L.O.L. 553 who was killed in an accident at work. His father, the late John Cross Senior, also a member of L.O.L. 553, and a few friends from L.O.L. 553 and Woodburn Ebenezer L.O.L. 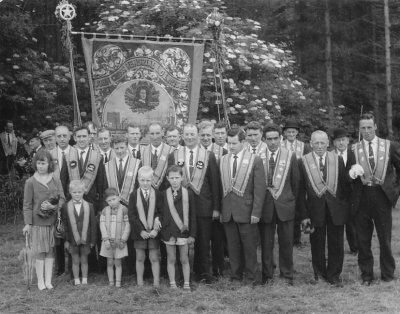 787 formed the lodge in Milebush Old School, Carrickfergus during February 1952. Up until the year 2000 the Lodge met in the Old School. However, the years have taken their toll on this stone building which initially served as a State Elementary School and the Lodge was forced, with great regret, to move to its present place of meeting at Kilroot Orange Hall. Meetings take place on the third Tuesday of every month. The first Worshipful Master was John Cross Senior with his eldest son Joe Cross as Secretary. 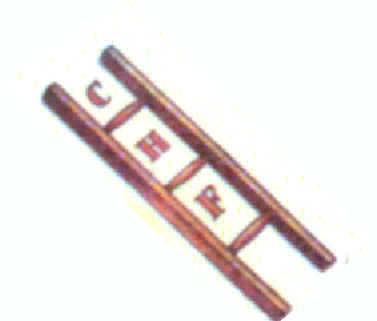 At present there are five immediate members of the Cross family belonging to the Lodge. Our banner was unfurled in Wilson?s field in 1982. It depicts John Cross clothed in his L.O.L. 553 collarette on the front and the landing of King William III at Carrickfergus on the reverse. Amongst the other items of Lodge furniture, the Worshipful Master?s chair stands out as an item of interest and superb craftsmanship. It was presented to the Lodge by the late W. Bro. Barfoot J.P. 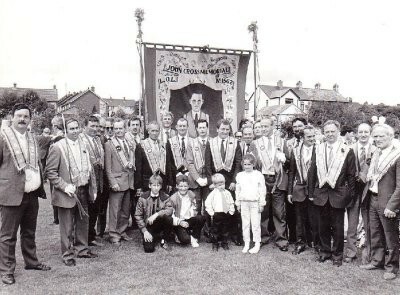 In earlier years the Lodge was led in fine style by the Eleanor McKee Memorial Silver Band, which is now sadly no more. Of late we have engaged top bands from Scotland to uphold the dignity with which we have become associated. Traditionally a ?country? Lodge, our Annual Divine Service is held each year on the first Sunday of June in Loughmore Presbyterian Church, which is situated in the hills above Carrickfergus. These services were conducted in the earlier years by the late Rev. James Beggs, minister of the Church and one of our distinguished members. Our longest serving member is Artie McAlister, who received his 50 years service medal in July 1996. A Past District Master, the late George Burgess, stands out over the years as one of the elders who has steered the younger men towards a life of honour, courage and faithfulness.